A collection of old house plans including a charming old farm house plan and a luxury Southern mansion house plan. Also featured is a period Craftsman house plan that expands the average Craftsman bungalow into an expansive country house. A selection of original old house plans ranging from farmhouse house plans to country house designs. The free house plans embrace almost every variety of arrangement and style—each one is accompanied with a detailed description of its floor plan. 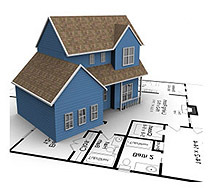 To home owners of period houses and historic houses, these old house plans will be valuable as a reference and aid them as suggestions either in the planning of restorations, adding additions, or in the remodeling of old houses, saving much time, study, and calculations. 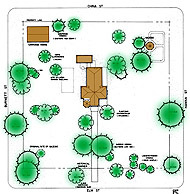 The house plans designs begin at the porch, move through the different rooms, and stop along the way to consider the various details. This brings about not only a consideration of the general arrangement of an old house, but provides such details as kitchens and pantries, plumbing, and laundry. The somewhat formal cottage garden, with a sundial, walks, seats, and a teahouse, are features that add much to the attractiveness of the cottage design. The cottage interior design showcases seven rooms, hall, bath, and pantry in addition to a second floor area. 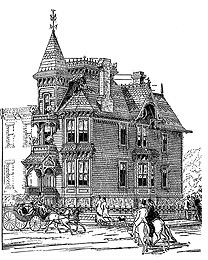 Find a collection of original house designs for Victorian style houses. 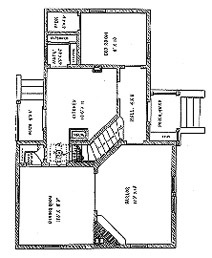 Featured is a period townhouse plan for a city residence and a cottage house plan for a French Gothic style country house with a kitchen supplied with all conveniences, back stairs to the second floor, and communication direct to basement; sink, table with cupboards below, and closet for kitchen cooking utensils. 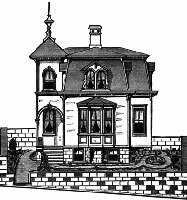 Another Victorian house plan is taken from Leffel's House Plans and show front and side elevations and floor plans of a very attractive nineteenth century cottage with an entrance hall which provides convenient access with parlor, kitchen, bedroom and chambers. You will truly feel transported to another time in history when you examine this selection of Victorian house plans.